Notes: Gardiki Castle (Greek: Κάστρο Γαρδικίου) is a 13th-century Byzantine castle on the southwestern coast of Corfu and the only surviving medieval fortress on the southern part of the island. 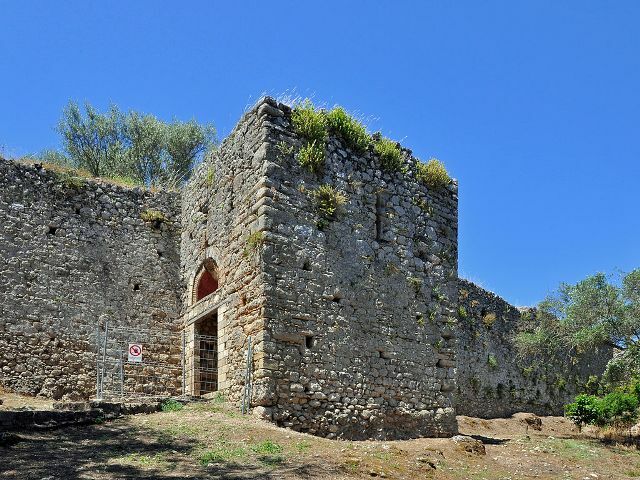 It was built by a ruler of the Despotate of Epirus, and was one of three castles which defended the island before the Venetian era (1401–1797). The three castles formed a defensive triangle, with Gardiki guarding the island's south, Kassiopi Castle the northeast and Angelokastro the northwest.Corfiote noble Andrea Marmora, the earliest historian of Corfu in medieval times, in his 1672 book Della Historia di Corfù mentions that the despots of Epirus adorned the city of Corfu with "most noble buildings" and built defences in other places on the island, including the fortresses of Gardiki and Angelokastro amongst other important sites.